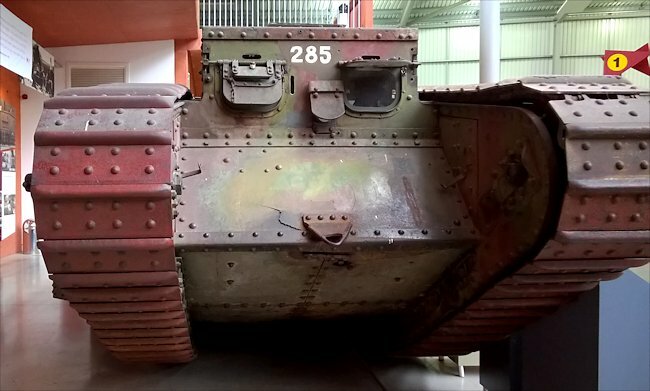 This WW1 British Mark II tank serial number 785 can be found at the Tank Museum, Bovington, Dorest, BH20 6JG, England. Their website is tankmuseum.org. This Mark II tank was built as a Male tank and was intended to be used to train tank crews. It was never intended to leave the UK and defiantly not be used in combat: it was not constructed using hardened bullet proof armoured plate. Its boiler plate steel construction body work would not stop machine gun bullets yet it was used in battle at Arras in 1917. It is the oldest surviving tank in the world that has seen action on a battlefield. It was one of the 25 Male Mark II tanks built by William Fosters of Lincoln. They also built 25 female machine gun only tanks. Bovington's Mark II tank was one of four tanks assigned to 3 section, 10 Company, D Battalion. It was given the name Dahlia and the number D5 was painted on the side of the tank. The plan for the battle of Arras required 60 tanks. Only 15 Mark I tanks were available. This is why 45 Mark II training tanks were called into action and shipped over from Britain. Lieutenant Noel Humphreys was the tank commander who took her into action on 9th April 1917. The other three tanks in 3 Section, 10 Company, D Battalion were put out of action during the fighting. Tank 785 managed to cross the start line and breach the enemy trenches to reach the objectives of Telegraph hill and Neuville Vitasse where she is reported to have done 'good work'. which normally means killed lots of German soldiers. Lieutenant Noel Humphreys was wounded early on in the action. 2nd Lieutenant Dawes took over command of Mark II Male tank Dahlia D5 on the 23rd April 1917 for its next action. It suffered a mechanical failure: its right drive train broke so it could not engage the enemy. The crew had to wait for the tank to be recovered to the repair yard. Once repaired 785 was issued to 12 Company and a new number D48 was painted on the side of the tank. On 3rd May 1917, 2nd Lieutenant Herbert Chick was given command of Dahila. It crossed the start line near Bullecourt and headed towards the German trenches. It smashed the barbed wire and engaged a number of enemy machine gun posts, knocking them out. Tanks cannot take ground. They need the supporting infantry to occupy enemy positions. This did not happen because of heavy enemy fire. Five of 2nd Lt Chick's crew were wounded. He had to rally, return to the British front line. After the battle of Arras the new Mark IV tanks arrived in France. Many of the surviving Mark II tanks were converted into supply tanks. This was the fate of 785. Its 6-pdr guns and machine guns were removed and the openings blanked off. A new larger roof hatch was added to the roof of the driver's cabin. It was given the new unit number of F53 and renamed 'The Flying Scotsman'. It is believed to have been attached to the 6th Battalion at the battle of Cambrai 20th November 1917. For some reason 785 survived being cut up for scrap metal and was returned to England. The Tank Museum at Bovington was given this tank in 1949. She was displayed as a Mark I tank until a real Mark I tank was obtained by the museum in 1970. She had been displayed out in the open due to the lack of indoor space at the museum. As them museum grew she was restored and given a place in the new tank hall out of the harmful effects of the British weather. As the original Male sponsons were no longer fitted to the tank and that the museum had been given the only example of an original Mark II female sponson the decision was made to display this male tank with an authentic female sponson fitted to the right side of this male tank and the left side sponson was left off. 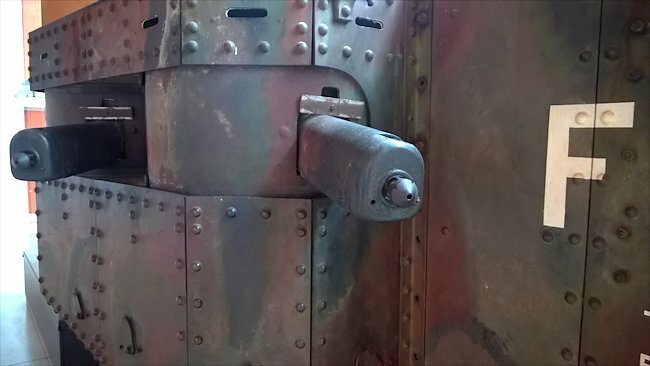 This enabled the visitors to look inside a WW1 tank. 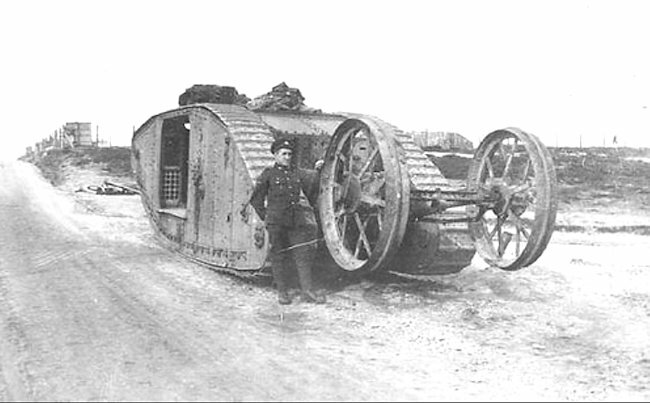 The British Mark II tank of 1917 was built as training tanks. Only 50 were built. The British built 150 Mark I tanks and produced around 2,000 Mark IV tanks. They realised they needed tanks to train the eight man crews and rather than spend valuable resources on manufacturing a fully combat ready tank the British High Command gave orders for a less specified tank to be built for use by the Tank Training School. The Mark II and Mark III tanks were designed to fulfill that role and fifty of each were produced. The Female Mark II tanks were mostly built by Fosters and Metropolitan in Birmingham. The Male Mark II tanks that had two 6 pounder main guns instead of two of the machine guns, were manufactured at William Foster and Co Ltd in Lincoln. The 10mm armour plating on both these tanks was not as strong as the Mark I and Mark IV combat tanks. It was not really bullet proof. A machine gun bullet would go right through it. They were used once in action at the battle of Arras in April 1917 simply because the new Mark IV tank was not ready for operational service yet. This was a very dangerous and daft decision. These tanks were not designed to go into combat. They just did not have enough protection for the crew. They were unarmoured, in the sense that the steel from which they were built was not heat treated to make it bullet proof. The reason being that these tanks were only intended for use as training machines. The tank driver's porthole with armoured flap for use when under fire. They were as slow as the Mark I going at around 4 mph. Most of them were supplied to the front line as 'male' tanks fitted with 6 pounder howitzers. 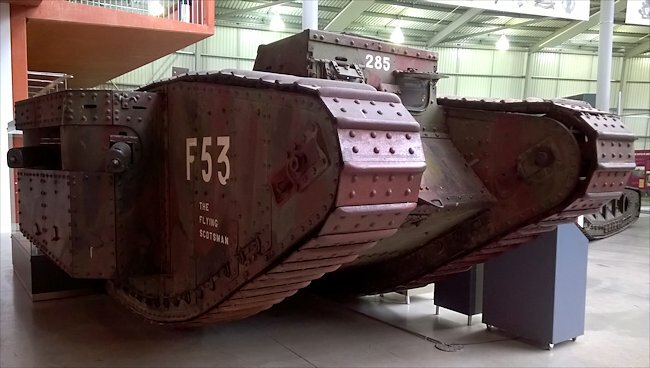 The Mark II tank at Bovington Tank Museum is a rather rare example of a Mark II tank armed as a 'female' tank with four Vickers 3.03 machine guns in an armoured jacket in sponsons, a projection on the side of the tank on both sides. These guns were intended to sweep each side of the tank by 180° killing enemy infantry as it pushed through their front lines. The drawback was that the crew hatch at the back of the sponson was very small. If the tank caught fire, which was a common event because the fuel in 25 gallon petrol tanks was kept at the front of the tank, it would quickly turn into a fire bomb. The crew had to get out very quickly. Although it was not the only way out it was the usual way out. It meant that four men on each side had to dive through the hole. They very rarely all made it. Many were burnt to death. Mark II Female tanks were armed with two Vickers 3.03 machine guns in an armoured jacket in sponsons, a projection on the side of the tank. This is the reason the 'female' version of the mark II tank was not very popular and why in later models the design was changed and the crew hatch was enlarged. You can identify a mark II tank by its narrow cab. 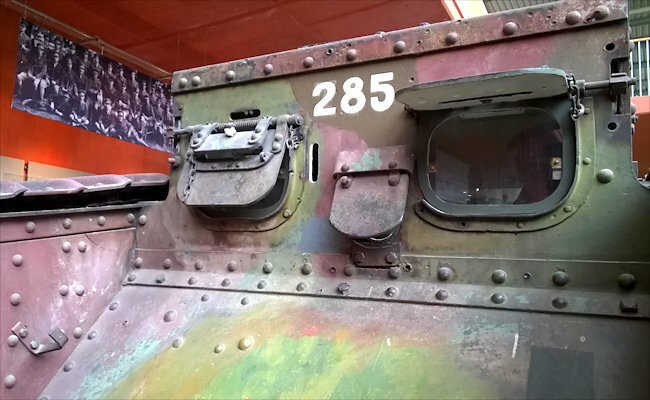 The sides of the cab on other tank versions normally went to the inside edge of the track. The designers were going to fit wider tracks to the Mark II and there for made the tank cab smaller. 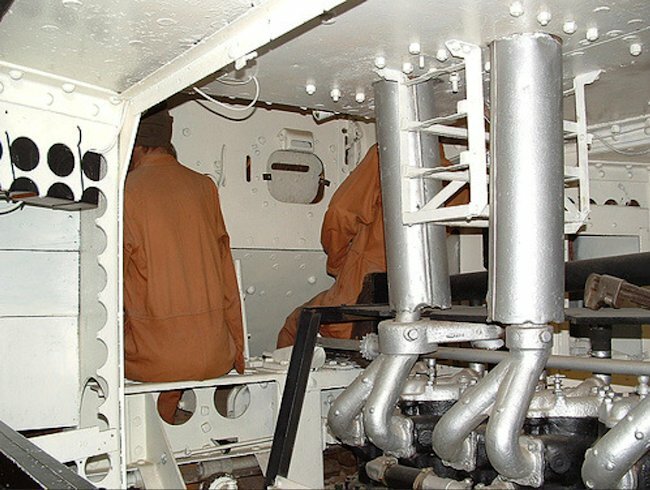 The wider tracks were never fitted so there is a visible gap between the inside edge of the tank track and the side of the cab which is not found on other British WW1 tanks. It had the same Daimler engine and clunky transmission as the Mark I tanks. It was used to train drivers at Bovington Army Camp and at Lulworth to train gunners. They were not designed for combat so many of the were later converted into supply tanks to deliver fuel, stores and ammunition up to the front for five fighting tanks. They lasted in that roll until the end of the war. Built as a Male Tank, No. 785. Took part in the battle of Arras, April 1917. Various features, in particular the hinged hatch on the cab roof and internal modifications show that this tank subsequently served in the supply role. Returned to the UK after the war. Exhibited as a Gate Guardian at Chertsey for some years. Around this time it was modified to resemble a Mark I, complete with tail wheel assembly and fitted with sample Male and Female sponsons In this guise it subsequently came to the Tank Museum, bearing the name HMLS Dragonfly. With the arrival of the Mark I Hatfield Tank, it reverted to a Mark II, remained a hermaphrodite, and was later renamed Flying Scotsman when the lettering was detected beneath later layers of paint. Strangely there is no trace of the name Flying Scotsman in 6th Battalion records. Early on the morning of 15th September 1916, as part of the five month battle of the Somme, 200,000 Allied troops were to advance along a 7 mile front. There objectives were the three fortified French villages of Courcelette, Flers and Morval. For the first time British tanks would lead a mass infantry attack. It was hoped that they would crush the barbed wire and suppress German machine gun fire. This would enable the following infantry to advance and storm the German trenches. After a massive artillery barrage small groups of tanks crawl slowly towards the enemy’s lines. Inside the Mark I tanks things are getting very unpleasant. Not only is there a tremendous amount of noise being generated by the large engine in the middle of the tank but there is a lot of heat. The exhaust towers that take the noxious fumes out via the top of the tank turn pink because they get so hot. As the tanks got closer to the German trenches the tanks have to slow down to negotiate the large shell holes left after the artillery barrage. British Lieutenant Basil L.O. Henriques, C company, Heavy Section MGC recalls what he saw as his Mark I tank reached ‘no-mans-land’. "We got to what looked like impossible ground. Hardly a yard was not a shell crater. It was like a rough sea made of holes. After 100 yards Tank George stopped with engine trouble. Down one very steep incline something happened to tank Archie. He reported it was out of action and I was to go on alone." Before long only nine of the tanks remained operational. The majority of the new British tanks break down rather than being stopped by enemy action. They stall, they run into mechanical problems, things simply break because of the stresses of the rough ride. British Lieutenant Arthur E. Arnold, D company, Heavy Section MGC was in a Mark I female tank called Dracula who observed, "The going was simply one succession of craters. It was thrilling how the tank would go down into a crater and dig its tracks into the far crater wall and steadily climb out." the tank was bucking up and down so the crew had to hold on or be thrown around inside the tank and get injured. Gunner Alfred H.R. Reiffer, D company, Heavy Section MGC was in a Mark I male tank when he spotted a German observation balloon. This was very serious because they continued artillery spotters who could call down artillery fire on advancing British tanks and following infantry. It had to be destroyed. One of the other gunners in the tank had a clear shot and fired several shots at the balloon with the 6pdr gun. It was hit, caught fire and fell to the ground. The German infantry soldiers in their trenches were appalled to see the approaching metal monsters. They had no idea that the British had this new super weapon. The first thing they hear is the loud deep rumbling. They had no idea what was coming towards them. They had never seen a tank or knew what it was capable of. Their rifles and machine guns were useless against its metal sides. To the tank crews it sounded like being in a hailstorm whilst sheltering under a corrugated tin roof. British Lieutenant B.L.Q. Henriques, C company, Heavy Section MGC was in one of the successful tanks that made it to the German trench line. "As we approached they let fire with might and maim. Then a smash against my flap let the splinters come in. Blood poured down my face." 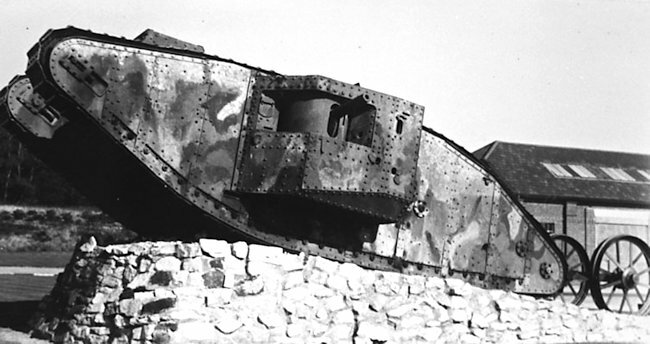 Lt Arthur E. Arnold’s Mark I female tank called Dracula got to the trenches first. "The tank was on top of the trench and there we paused, whilst the Vickers guns raked the trench and then on we went again. One of the remaining tanks got through the shell shattered remains of Delville Woods, over the trenches and entered the fortified village of Flers, the centre of the German defensive line. Alfred H.R. Reiffer, in his D company Mark I Male tank said, "We entered the village, which was a heap of rubble with the skeletons of a few houses still standing. There was hell outside. We spotted a couple of German machine gunners who were firing at us. Four rounds from the 6pdr put them out of action." The French village of Flers had been liberated. A British spotter plane observed tank D17 move down the main street of Flers. "The scene in Flers was without president. Firing as it went the tank lurched up the main street. Followed by parties of cheering infantry." the word spread quickly to the civilian population back in Britain who were eager for good news from the Western Front. They celebrated the victory and the new super weapon. Was it a success? Within four days British General Haig orders 1,000 tanks to be built. From his point of view he has realised that tanks have a roll in modern warfare. Where can I find other preserved Mark II Tanks? I think this is the only one - Do you know of any?